July 17, 2015 – by Hadi Ghaemi – The nuclear accord reached this week between Iran and the P5+1 countries represents a resounding victory for diplomacy and peace. It was achieved only through unrelenting determination borne from a realization that the benefits of an accord far outweighed those of any alternative. The authorities restricted freedoms of expression, association and assembly, arresting, detaining and prosecuting in unfair trials minority and women’s rights activists, journalists, human rights defenders and others who voiced dissent. 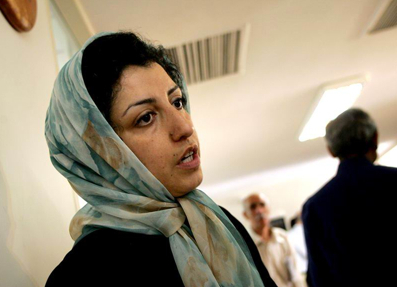 07.10.2015 – The Observatory for the Protection of Human Rights Defenders, a joint programme of the International Federation for Human Rights (FIDH) and the World Organisation Against Torture (OMCT), expresses its grave concerns regarding the pressures exerted on the arbitrarily imprisoned human rights defender Ms. Nargess Mohammadi in Iran.